I have the day off today, and can’t think of anything better to do than invest time in learning a new technique. Today, I’m making pizza and I’m going to make the dough from scratch for the first time. I’ve even purchased a back up pizza crust in case this turns out to be an utter failure. Anything that involves exact ingredient amounts is a little intimidating because there’s pretty much no room for error. I’m used to tossing things together by using half-assed and approximate measurements, so this is going to be interesting. I did some research and determined that this how-to video was the best way to get started. I’d like to say I got it right on the first try, but I’d be lying. It took me 5 times to get the yeast to rise. It seems my days of working without a food thermometer are over. The water really needs to be just the right temperature for the yeast to react and it’s really hard to guess what 100 degree water feels like. Finally – I got it to rise! While waiting for the dough to rise, it was time to start prepping the ingredients for the sauce. The sauce takes about 20 minutes to make, and probably could be made up to an hour in advance of use. I let the dough rise for an hour and a half the first time, but I didn’t let it rise a second time as the video suggests because I was making only one pizza crust. I’m so uninformed in this area that I have no idea what benefit letting the dough rise for a second time would serve, but by this time, it had been almost 2 hours since I started this project and I was getting hungry. So on to stretching the dough I went. I’m a long way from looking professional while stretching that dough, but it was a lot of fun. 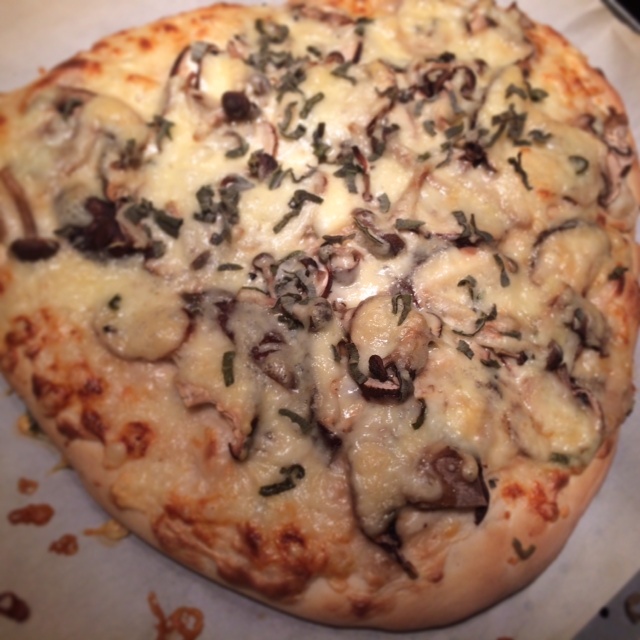 And, contrary to what I believed, you don’t need a rolling pin to stretch the dough. You could probably use one, but tossing it with your hands probably a lot more fun. Into the oven my pie went (Wait, I just realized I made pizza on Pi day. That was not intentional, but I may as well point it out!) 18 minutes later, I dressed it with the truffle oil and took a bite. It was really, really good. The flavors were just as savory as I was hoping for. The only thing that was bothersome is that the dough was too salty, and I also didn’t stretch it thin enough, so it was pretty dense. But those two things can be easily corrected. I will definitely be doing this again, I am determined to get the right crust! Sprinkle yeast on top of 1/2 cup water, sprinkle sugar on yeast and stir gently. Let sit until foamy, 15-20 minutes. 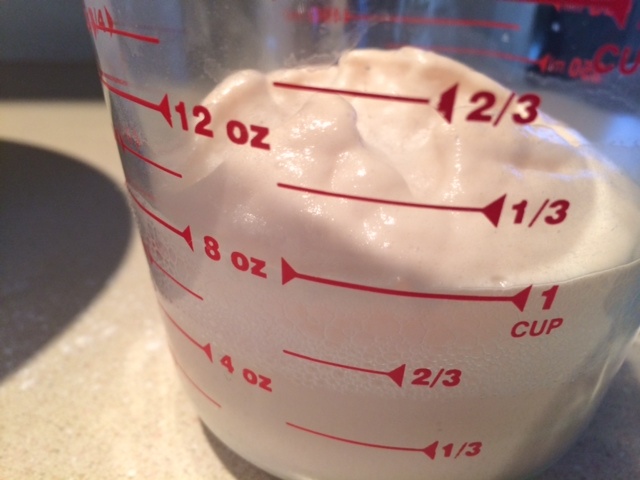 Measure flour, salt and oil into a large bowl. Add the yeast mixture and remaining water. Stir to incorporate. Scoop the dough mixture onto table or countertop for kneading. Knead dough until smooth and elastic, about 5-8 minutes. Time will depend on the speed and force applied during the kneading process. Round the dough and place back in bowl. Cover and let rise until doubled. Take dough out of bowl and divide into pieces. Round, flour generously and cover. Let rest until risen 1½ times in size. 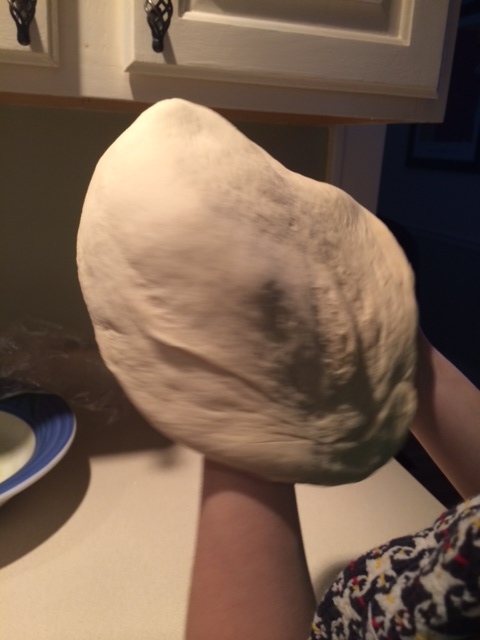 Pizza Dough is ready to use. Gently heat milk in a small saucepan, just until barely simmering. Remove and keep covered. In a separate saucepan, melt butter and add the shallot. When foam subsides, add flour and stir until smooth. Cook for 1 to 2 minutes, stirring. Do not allow flour to color. Gradually add the warm milk, whisking to combine. Add the salt and increase the heat to medium. Cook the mixture, whisking continuously, until the sauce comes to a boil and is thickened. Remove from heat and add 10 of the roasted garlic cloves. Pour the hot mixture into a blender, cover tightly, and process until smooth. Transfer to a small bowl and cool slightly, placing a piece of plastic wrap directly on the surface. When the dough is ready, layer on the garlic sauce. 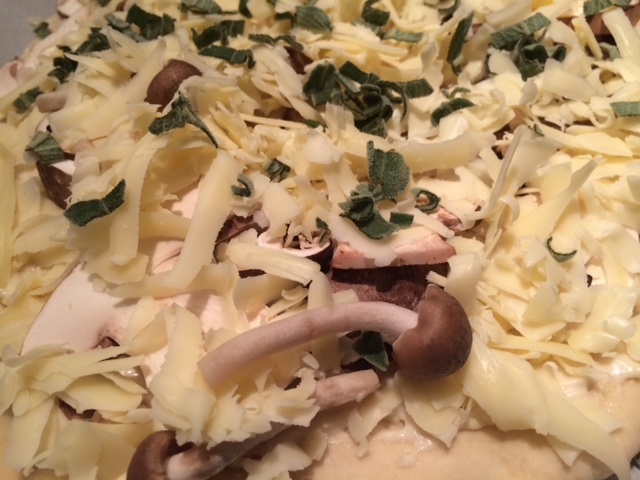 Top with cheese, then mushrooms, a little more cheese, then the sage. Bake for 15-18 minutes or until crust is golden. Drizzle with a little truffle oil just before serving.